Today we can announce that we have submitted a planning application to open a 173-room aparthotel at Louisa Ryland House, in the heart of Birmingham’s Central Business District. Leading firm Archer Humphreys Architects, the creative force behind London’s Chiltern Firehouse and our Manchester City Centre aparthotel scheme opening later this year, has put together the plans for the 81,280 Sq ft. building’s conversion from a disused office block to boutique, design-led 4-star aparthotel. 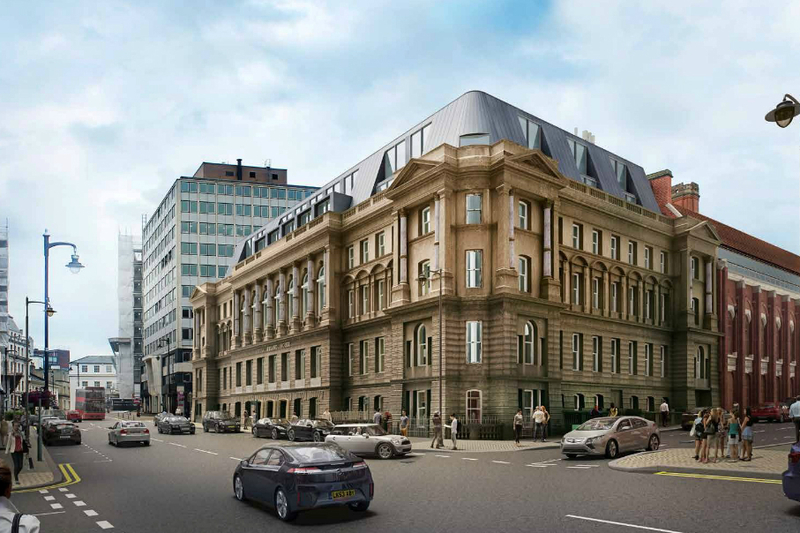 Louisa Ryland House, one of the city’s most iconic Grade II-listed buildings, will offer a uniquely special place for Birmingham’s business and leisure travellers, at the heart of the arts and cultural centres of the City and equidistant between Snow Hill and Brindley Place. It is owned by Euro Property Investments Ltd. The location occupies several Grand Civic 19th century buildings with highly decorative facades, generous floor to ceiling heights and magnificent windows, an important part of the buildings’ listing. At ground-floor level, the aparthotel will benefit from over 14,000 Sq ft. of space that will be transformed into an exciting mix of uses including a restaurant, coffee shop, fitness studio and co-working space. A striking glass-roofed conservatory will expand from the reception area through to an open-air courtyard area for guests to relax, eat and drink. Guest rooms, with their open-plan kitchens, will have a focus on natural materials and colours, with high-quality furnishings including walnut parquet floors and doors. Birmingham’s status as the country’s second City has helped establish its hotel market as one of the best performing amongst cities in the UK. Over the past 12 months, the average revenue generated per hotel room has risen by 9.1%, making it an attractive proposition for hotel operators. Guy Nixon, Founder & CEO of Native, said: “We are delighted to be breathing new life into one of Birmingham’s most historic and beautiful buildings. Whilst respecting the rich heritage of the site, we will be instilling the quality and service that you would expect from a boutique four-star aparthotel from Native. “Increasing numbers of business and leisure travellers are buying into the aparthotel concept, which provides the independence of apartment living with the service and flexibility of a hotel.